The Potomac River tumbles down the mountains from Fairfax Stone, West Virginia, (the North Branch) and Highland County, Virginia, (the South Branch) and flows just over 400 miles to its 19-mile-wide mouth at Point Lookout in southern Maryland on Chesapeake Bay. Along the upper Potomac you’ll find rapids, waterfalls, good smallmouth bass fishing, canoeing and kayaking along the Potomac National Trail route, in addition to a good deal of Civil War history, including the site of John Brown’s uprising at Harpers Ferry. Below the fall line at Little Falls, Virginia, is the Potomac’s tidewater region, which includes Washington, D.C., and Old Town Alexandria, Virginia. 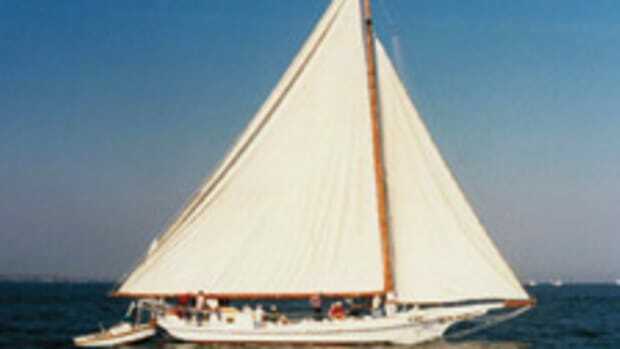 Although it adds some 92 miles (one way) to the adventure, a side trip up the Potomac from the Chesapeake can be included in a Great Circle circumnavigation of the East Coast. National Harbor, across the river from our nation’s capital, is a member of the America’s Great Loop Cruisers’ Association. 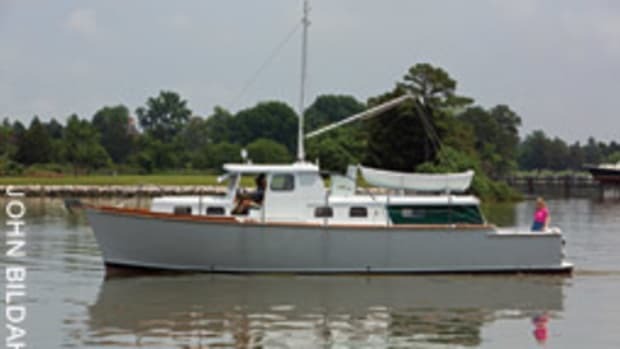 To get to the D.C. area, boaters enter the Potomac at Point Lookout, at the southern tip of St. Mary’s County, Maryland, where the river is 11 miles wide and can be difficult to maneuver in bad weather. Heading upriver, the tides will generally remain less than 2 feet, and the current less than ¾ knot. 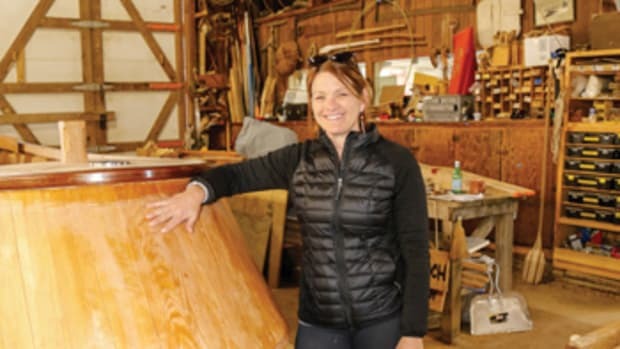 The channel is well-marked and maintained at 24 feet for the barges and tugs that ply this waterway, but the toughest part of cruising the lower Potomac may be finding facilities to dock, fuel and service your boat. Good sites to visit along this stretch of the river include Point Lookout State Park and St. George’s Island, known for its seafood (especially oysters), fishing and camping. Port Kinsale on the Virginia side, home to the Kinsale Museum, which features local maritime history, and St. Clements Island, which has the Potomac River Museum and exhibits on the founders of the state of Maryland, make for interesting stops. 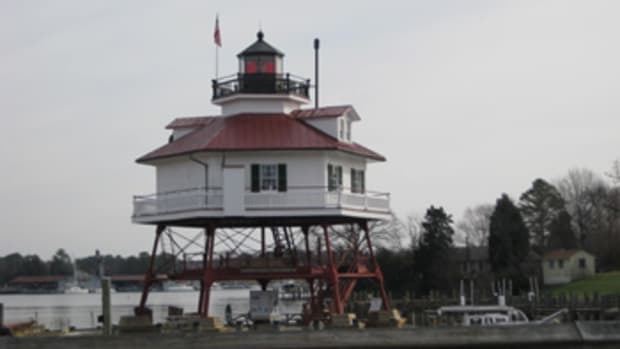 Once you get closer to Washington, there are more docking and service facilities, particularly in Occoquan Bay on the Virginia side and in the Fort Washington area on the Maryland side. Several of these facilities offer full services, and they can get crowded during the summer, so calling ahead is a good idea. Navigating in this section of the Potomac shouldn’t be difficult, as the channels were designed for ships going to the Washington Navy Yard and are at least 20 feet deep, well-marked and wide. The tidal variation is 2½ feet to 3 feet, and winds control the tidal variations as much as the tides do. 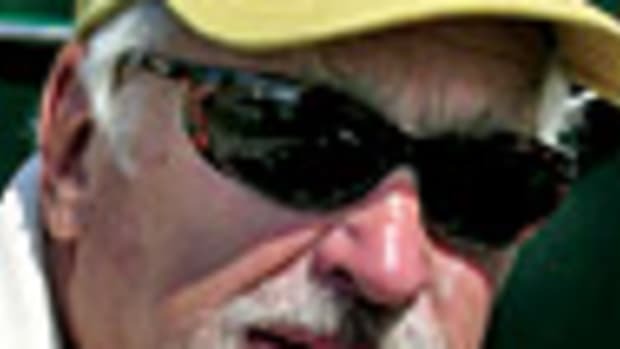 One professional captain explained to me that a stiff west wind creates extreme low tides and minimal high tides, whereas a stiff east wind can cause the opposite. Once in the D.C.-Alexandria area, fun destinations proliferate. Downtown Alexandria features a public marina, 23 acres of parks and hiking trails, restaurants, shops and historic sites, including the Carlyle House — the 18th century residence of city founder John Carlyle — and the National Inventors Hall of Fame. Nine miles away is George Washington’s Home at Mount Vernon. Another unique place to visit is the Torpedo Factory in Old Town Alexandria. A former munitions plant, it’s now one of the largest collections of publically accessible working artist studios in the United States. On the Maryland side of the Potomac, National Harbor is not just a good spot to dock your boat but also a worthy destination. And it’s not hard to see why. If you’re hungry, there are more than 30 places to eat, from steakhouses to coffee shops to Wolfgang Puck’s Brews and Bites right on the dock — next to the 180-foot-tall Capital Wheel, a ferris wheel from which you can see the National Mall, the Capitol and Arlington National Cemetery. There are more than 150 retailers, including a Tanger Outlet, and six hotels, including the Gaylord National Resort and Convention Center with 2,000 rooms. In addition, MGM Resorts plans to open a hotel with 308 rooms in the latter half of this year that will include retail shops, a spa, world-class dining and a casino. If you want to visit the National Mall or Old Town Alexandria, water taxi service is available. 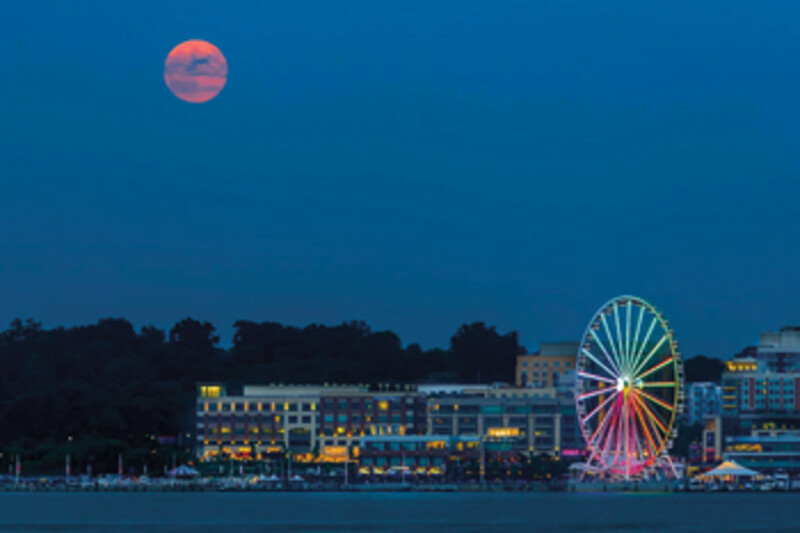 Spirit Cruises operates from National Harbor as well, giving great views along the Potomac and access to Mount Vernon and the D.C. waterfront. The Marina at National Harbor features 77 slips in new floating docks with wide fairways that can accommodate boats to 100 feet. They accept transients, both overnight and hourly, have a fuel dock, pumpout facilities and heads with showers. 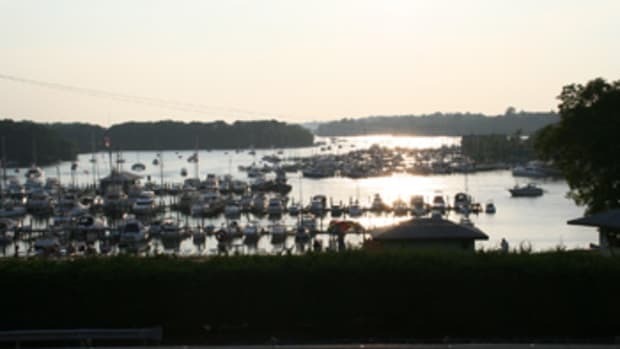 The nearest full-service repair facilities are the Fort Washington Marina on the Maryland side (with a 35-ton lift) and the Washington Marina in D.C. on the Washington Channel, which may be your best chance on the Potomac for mechanical parts. So if you want to visit he nation’s capital region by boat, you’ll find it a bit out of the way, but with proper planning, it’s thoroughly worth the trip.